With a bright, sunny-tasting recipe like this one for lemon flavored cupcakes filled with lemon curd, I’m always tempted to try and come up with a cute name for the cakes. Sunny Cupcakes. Lemon Heaven Cupcakes. Juicy Lemon Cupcakes. 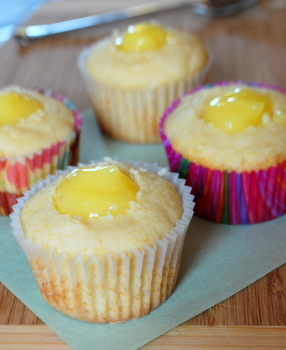 But I usually like to know what I’m getting when I look at the name of a recipe, so I end up coming back to the simple, but clear, Lemon Cupcakes Filled with Lemon Curd. I just dub them with a cute name when I bring them out to serve. I was inspired to make these cupcakes after catching a few minutes of a Food Network show where a baking contestant (on the Ultimate Recipe Showdown) made something similar with a cake mix. I couldn’t resist doing a from-scratch version, just like I couldn’t resist doing a from-scratch version of the first place Double Delight Peanut Butter Cookies that won the Pillsbury Bake-Off last year. I kept the lemon flavor in the cupcakes subtle, so that the lemon curd really has a chance to stand out, and added some vanilla into the batter, as well. A vanilla and lemon cupcake also cuts the zestiness of the curd a little and allows the whole thing to come together (so you’re not tasting a mouthful of lemon curd – not that there’s anything wrong with that!). I used the lemon curd recipe that I usually use for this batch of cupcakes, but I doubled it so that I would have plenty of curd to work with. I like a lot of curd in my cupcakes. If you don’t want to make your own, it’s perfectly fine to use store-bought lemon curd or your other favorite recipe. In a large bowl, cream together butter, sugar and lemon zest until light and fluffy. Adding the lemon zest early helps release more of its flavor. Blend in eggs one at a time, followed by vanilla extract. Stir in 1/3 of the flour mixture, followed by half of the milk. Add another 1/3 of the flour and the remaining milk, then stir in the remaining flour, mixing only until no streaks of flour remain. Divide batter evenly into prepared muffin cups, filling each approx 2/3 to 3/4 full. Bake for 16-19 minutes, until a toothpick inserted into the center comes out clean and the top springs back when lightly pressed. To fill, use a melon baller to scoop a small hole in the top of each muffin. Alternatively, you can use a small knife to carve a small cone of cake out. Fill the depression with 2 tsp lemon curd. Serve shortly after filling. Unfilled cupcakes can be stored in an airtight container until ready to fill and serve. I love lemon curd, and can’t for the life of me remember the last time I had some. I watched that episode, and I too vowed to make something similar soon. You beat me to it :] Yours look great! I love me some lemon curd. I just made a batch of lemon curd last night. What a good idea for using it! These are incredible, but it is the lemon curd that puts them over the top. I just made them and I’ve already indulged in two! Stop me! I love lemon. These would really hit the spot about now. I made these cupcakes today and love them! Everything I’ve tried of yours turns out great. Thanks so much for sharing all these great recipes! Those cupcakes look really good! Thanks for sharing this recipes. Can we change the lemon to strawberries or blueberries? this is what i was looking like i will do some changes but will keep the lemon filling. I just made a batch of these but placed the lemon curd on top of the batter thinking it was going to sink in… boy did th lemon curd boil over. they smell absolutely delicious but have yet to try them. so excited!! and despite bubbling over, the warm lemon curd sunk in slightly and was delicious. the cake smells and taste delicious. thanks! I made a dozen of these; it was easy to cut the recipe in half, and I subbed in 1/3 cup white whole wheat flour just because I’d gotten to the end of the bag of all-purpose and didn’t feel like opening a new one. I also made your lemon curd. Great recipes! They worked perfectly and taste absolutely delicious. The lemon curd was a real revelation. Thanks!